What is true for humans is also true for baboons: The tougher the childhood, the higher the risks of premature death later in life. A new study from the University of Notre Dame, Duke University and Princeton University finds that wild baboons that experience multiple misfortunes during the first years of life, such as drought or the loss of their mother, grow up to live much shorter adult lives. Their life expectancy is cut short by up to 10 years compared with their more fortunate peers. The “bad luck” babies not only lost more than 10 years off their adult lives, they also had fewer surviving offspring. “It’s like a snowball effect,” said Elizabeth Archie, associate professor of biological sciences at Notre Dame and a co-author of the study. The findings, which appear online in Nature Communications, come from a long-term study of 196 wild female baboons monitored on a nearly daily basis between 1983 and 2013 near Amboseli National Park in southern Kenya. The results are important because they show that early adversity can have long-term negative effects on survival even in the absence of factors commonly evoked to explain similar patterns in humans, such as differences in smoking, drinking or medical care, said Jenny Tung, an assistant professor of evolutionary anthropology and biology at Duke who co-authored the study. 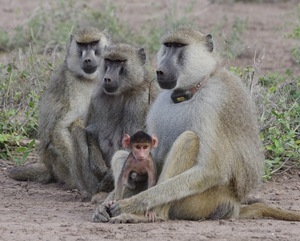 Baboons who lost their mothers before age 4, or whose next-born sibling arrived before they were fully weaned, were found to be the most vulnerable. Young females that experienced just one or no adverse events — a group the researchers nicknamed the “silver spoon kids” — generally lived into their late teens and early 20s, whereas those that endured three or more often died by age 9. Two females named Puma and Mystery, for example, were both born during years of little rainfall, and raised by low-ranking moms who died before their third birthdays. Puma eventually met her end at age 7 at the jaws of a leopard. Mystery lived until her disappearance at age 14, presumably to a predator, leaving behind a single infant who died shortly thereafter. Together with study co-author Jeanne Altmann of Princeton, the team plans to investigate how some baboons manage to overcome early adversity. It could be that those that form and maintain supportive relationships as they grow older are better able to survive and thrive, Archie said. Baboon DNA is 94 percent similar to that of humans, which indicates these patterns could be deep-rooted in primate physiology, the researchers say. “This suggests that human adult health effects from childhood stresses are not simply products of the modern environment, but have likely been present throughout our evolutionary history,” says George Gilchrist, program director in the National Science Foundation (NSF)’s Division of Environmental Biology, which funded the research. This research was supported by grants from the National Science Foundation and the National Institute on Aging at the National Institutes of Health. Funding for the project has also been provided by Duke University, Princeton University, the Chicago Zoological Society, the Max Planck Institute for Demographic Research, the L.S.B. Leakey Foundation and the National Geographic Society. The study can be found here: http://www.nature.com/ncomms/2016/160419/ncomms11181/full/ncomms11181.html. Originally published by Notre Dame News at news.nd.edu on April 20, 2016.